Question: What advice would you give a new student who finds himself at a Kabbalah lesson for the first time? Answer: Our Source is called “Infinity” (Ein Sof). From there and through the World of Adam Kadmon (AK), the Light descends to the common Tabur (navel). Below are the Partzufim of the World of Atzilut: Atik, Arich Anpin (AA), Abba ve Ima (AVI), and ZON (Zeir Anpin and Nukva). Below them are the Worlds of Beria, Yetzira, and Assiya (BYA). We study what is happening in the World of Atzilut. For us, it’s of utmost importance for here is where governance is conducted, where the past, present, and future are contained. It is concluded with the Parsa (border, separating line) which restricts the diffusion of the Light of Hochma (Wisdom). Below, in the Worlds of BYA, there are the broken souls, whereas our world is all the way at the bottom, below the common finishing (Sium) line which stems from Infinity. Here, we exist in our bodies until we are awakened spiritually. The souls raise their desire, their appeal for correction, to Malchut of the World of Atzilut. She utilizes her connection with Zeir Anpin and raises the souls’ desire to him. To the extent that Zeir Anpin connects to Malchut, they become a joint Partzuf called ZON and ascend to AVI. Zeir Anpin ascends to Abba, the fatherly Partzuf, while Malchut ascends to Ima, the motherly Partzuf. ZON obligates “father and mother” to give them all the necessary Lights, corrections and fulfillments, and then return to their places. There, they become “big,” acquire the adult state of Gadlut. This helps us clarifiy the meaning of the two states of the “rose” or Malchut: Katnut and Gadlut. In the first state, she represents only the point of the Upper Sefira, Keter, whereas its other nine Sefirot are below the Parsa. Also here are the forces of filth (Klipot, shells). This is the meaning of the phrase, “a rose among the thorns”: Malchut among the Klipot. It is Malchut’s first, smallest state. In her adult state, Malchut elevates her lower nine Sefirot, makes a Zivug (mating, coupling) with Zeir Anpin by unifying with him, and thereby becomes a genuine rose, blossoming to its full beauty. 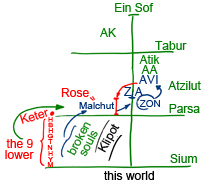 Malchut can become this way only when her “thorns,” meaning Kelim (vessels) that are unconnected and unfulfilled by Zeir Anpin, ascend to a Zivug with him. All of this is evoked by the broken souls when they unite together, and it is they who bring about the correction of Zeir Anpin and Malchut. Herein lies our entire work: to bring about the correction of ZON until they reach their ultimate state. Unlike in our world where faith is called some assumption taken as a fact, in the wisdom of Kabbalah, faith means the sensation of the Creator. Faith is Bina, the property of bestowal. When we acquire it, we reveal the common force which fills the world. Then we feel it, exist in connection with it, and attain it. This is called reason. In this case, why are we talking about faith above reason? When I exist in the egoistic nature, I have some knowledge or opinion. In order to rise to the spiritual level, I need an external power which will transform me, and as a result will lift me to a new level of perception above egoism to the property of bestowal. This perception is called faith, the power of Bina. Meanwhile, our corporeal knowledge is received inside us, in the property to receive, in Malchut. If I have achieved bestowal, faith, the Light of Hassadim (Mercy), then I become filled with the Light of Hochma (Wisdom) or reason. Once I become filled with reason (knowledge), I exist in the next state, in Malchut. Once again, I have to rise to a higher degree. How do I do that? I do it with the help of faith, the power of Bina, the Light of Hassadim, bestowal. When I have the Light of Hassadim, I fill it with the Light of Hochma again. Then again I have reason (knowledge). This way I advance by using faith above reason. This is precisely the lever that allows me to rise more and more each time. It seems to us that we are in a world that really exists and is relatively stable. We don’t even allow the thought that everything we see is unstable and relative. Humanity has always believed that the world really exists and that we’re living in it. This belief was strengthened by the fact that people saw our planet, the stars, and the galaxies. Although a person is born, lives, and dies, all of these things remain in their place despite the changing times. That is, everything that surrounds us exists outside of us. People believed it for thousands of years. Then, the science of Kabbalah comes along and completely destroys the foundation upon which our perception was based. First and foremost, this science explains that everything we see before us actually exist within us, within our desire, and not outside of us. This means that if the people I see before me exist in my head, then I exist there as well. According to Kabbalah, this is true, and our current perception of reality is false. Kabbalah tells us that we have a “projector” in the back portion of the brain and that it projects all that I sense into images I see before me. This is how I’m able to see my own body as well as everything outside of it. Kabbalists state this with grave seriousness, emphasizing the fact that it’s precisely due to the fact that I sense things within me and see them on the outside that I can reach special attainment, the revelation of the Creator. I see how, in each moment, everything around me changes and gains momentum. This happens in accordance with the changes in my qualities and it means that I’m drawing my reality. The wisdom of Kabbalah tells us that besides the point called “I,” everything else is the Upper Light, the Light of Infinity, where I exist. The only quality of this Light is love and bestowal. On the backdrop of this love and bestowal I see my own qualities which are opposite to the Light. It seems to me that there is a big world existing outside of me where everything is moving. However, all this is being projected by my desire, by my ego and its various qualities, showing me my inner picture as though on an x-ray. Can I change reality? Yes, but under the condition that I change myself. This is very serious. I have my family, my work, and a big world around me. Although I sense all of these thing as solid, it’s still in my power to change it all. If I begin to change myself, then I’ll change the world because a person is a miniature world that contains everything within him. On the outside, there is only constant Light of the World of Infinity. Therefore, everything depends on the person. My perception of reality depends only on me, not on someone else. The wisdom of Kabbalah is particularly the science that explains to us how to change ourselves. Then, accordingly, our world turns into a different, upper world in which various changes begin to take place. Kabbalah tells me that I am situated against the Light, but I don’t feel it. Instead, like in an x-ray picture, I see my own qualities in front of me. In other words, if I see people, stars, or the whole world; all of these are my qualities against the Light. How do I begin to change at least something in me? I want to make sure that this picture truly is a result of my inner world and that it is not coincidental. So, I begin this game. I change myself in some regard, and the picture around me also changes. I change a little more, and again the surrounding world changes slightly. It truly is an interesting game! In the article “The Creator’s Concealment And Revelation,” Baal HaSulam writes that to a person who has a particular perception of reality it seems at first that some people are successful, others are miserable, and others are ill. However, after he changes himself, he sees that the same people are completely different. Those who seemed stupid, suddenly become smart, poor people become rich, and successful people suddenly lose everything. In order to change your qualities and control reality through this, we are given a teacher, books, and a group in the present reality. If we use them to reveal the Light or Creator, the qualities of bestowal and love, we rouse the Light that exists outside of us, and this Light influences our desire, changes it until it becomes equal to Him, the Creator. It turns out that if I desire to change something, I only need to change myself.